Art Spiegelman – "Morgan Lecturer"
Through a chronological tour of the evolution of comics, this Pulitzer Prize-winning artist/illustrator explains the value of this medium and why it should not be ignored. The event is Dickinson College’s annual Morgan Lecture in honor of James Henry Morgan, professor of Greek, dean, and president of the college. Co-sponsored by The Milton B. Asbell Center for Jewish Life, The Trout Gallery, Women’s Center, the Office of Institutional and Diversity Initiatives, and the Departments of Political Science, English, German, Judaic Studies, Art and Art History, History, Sociology, and Film Studies. Comics are a graphic medium in which images are used to convey a sequential narrative. The term “comics” arose because the medium was at first used primarily for comedic intent. Today the term is applied to all uses of the medium, including those which are far from comic. The sequential nature of the pictures and the predominance of pictures over words distinguish comics from picture books, though there is some overlap between the two media. Different conventions have developed around the globe, from the manga of Japan to the manhua of China, and to the larger hard cover comic albums in Europe. Comics as a real mass medium started to emerge in the United States in the early 20th century with the newspaper comic strip. The strip quickly developed into a standardized form, one with images and speech balloons. The combination of words and pictures proved popular, and quickly spread throughout the world. Comic strips were soon gathered into cheap booklets or comic books. Original comic books soon followed. Comics in the United States is usually traced back to the first appearance of the Yellow Kid in the New York World newspaper in 1895. Today, comics are found in newspapers, magazines, comics books, graphic novels, and on the Web. Although historically the form dealt with humorous subject matter, its scope has expanded to encompass the full range of literary genre. 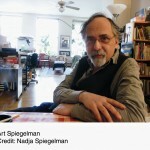 Having rejected his parents’ aspirations for him to become a dentist, Art Spiegelman studied cartooning in high school and began drawing professionally at age 16. He went on to study art and philosophy at Harpur College before becoming part of the underground comix subculture of the 60s and 70s. As creative consultant for Topps Bubble Gum Co. from 1965-1987, Spiegelman created Wacky Packages, Garbage Pail Kids and other novelty items, and taught history and aesthetics of comics at the School for Visual Arts in New York from 1979-1986. In 2007 he was a Heyman Fellow of the Humanities at Columbia University where he taught a Masters of the Comics seminar. In 1980, Spiegelman founded RAW, the acclaimed avant-garde comics magazine, with his wife, Françoise Mouly—Maus was originally serialized in the pages of RAW. They’ve more recently co-edited Little Lit, a series of three comics anthologies for children published by HarperCollins (“Comics-They’re not just for Grown-ups Anymore”) and Big Fat Little Lit, collecting the three comics into one volume. Currently, he and his wife publish a series of early readers called Toon Books—picture books in comics format. They have co-edited A Toon Treasury of Classic Children’s Comics (Fall 2009). His work has been published in many periodicals, including The New Yorker, where he was a staff artist and writer from 1993-2003. A collection of his New Yorker work, Kisses from New York was published in France, Germany and Italy, and will be published in the U.S. by Pantheon, who also published his illustrated version of the 1928 lost classic, The Wild Party, by Joseph Moncure March. In 2004 he completed a two-year cycle of broadsheet-sized color comics pages, In the Shadow of No Towers, first published in a number of European newspapers and magazines including Die Zeit and The London Review of Books. A book version of these highly political works was published by Pantheon in the United States, appeared on many national bestseller lists, and was selected by The New York Times Book Review as one of the 100 Notable Books of 2004. Spiegelman’s work also includes a new edition of his 1978 anthology, Breakdowns (Fall 2008); it includes an autobiographical comix-format introduction almost as long as the book itself, entitled Portrait of the Artist as a Young %@&*! ; as well as a new children’s book (published with Toon Books), called Jack and the Box. Additionally, in preparation is a book with a DVD about the making of Maus, entitled Meta Maus. In 2009 Maus was chosen by the Young Adult Library Association as one of its recommended titles for all students (the list is revised every 5 years and used by educators and librarians across the country). McSweeney’s has published a collection of three of his sketchbooks entitled Be a Nose. A major exhibition of his work was arranged by Los Angeles Museum of Contemporary Art, as part of the “15 Masters of 20th Century Comics” exhibit (November 2005). In 2005, Art Spiegelman was named one of Time Magazine’s 100 Most Influential People and in 2006 he was named to the Art Director’s Club Hall of Fame. He was made a Chevalier de l’Ordre des Arts et des Lettres in France in 2005 and—the American equivalent—played himself on an episode of “The Simpsons” in 2008.